Caroline Williams, PhD., MP (medical psychologist), is a clinical prescribing psychologist in New Mexico. She has experienced psychopharmacology from both sides; as a provider referring patients for medication management, and for the last five years as a prescriber. 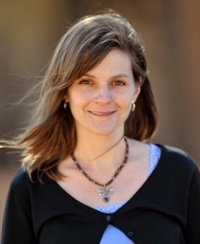 Currently she provides medication management services in private practice, and for The LifeLink, both in Santa Fe, NM .She has worked as a clinical psychologist for more than 19 years. Her practice has included psychological evaluation, psychotherapy, consultation, forensic work, supervision, and training. Dr. Williams has provided training and education to many professional and consumer groups. She has presented at the American Psychological Association (APA) yearly conference, and has trained psychologists through the New Mexico Psychological Association (NMPA), and the Texas Psychological Association (TPA). She has taught consumers and their supporters through the National Alliance for the Mentally Ill (NAMI), and Court Appointed Special Advocates (CASA). Dr. Williams has taught at the University of New Mexico, and at New Mexico State University’s prescribing psychologist degree program. Find out more about Dr. Williams and her professional activities at www.carolinewilliamsphd.com.